The countryside around Hoedspruit is some of Limpopo’s prettiest. It is littered by incredible game reserves, and has earned its place on the map for its mango and citrus products. These landscapes are part of the Kruger to Canyons Biosphere, which is a registered UNESCO World Heritage Site. This is the largest of three biosphere reserves in South Africa, and is the third-largest in the world. It is made up of beautiful forests, savannahs and grasslands; and Hoedspruit is at its heart. Hoedspruit is 74 kilometres from the Phalaborwa Gate and 68 kilometres from the Orpen Gate of the Kruger National Park. 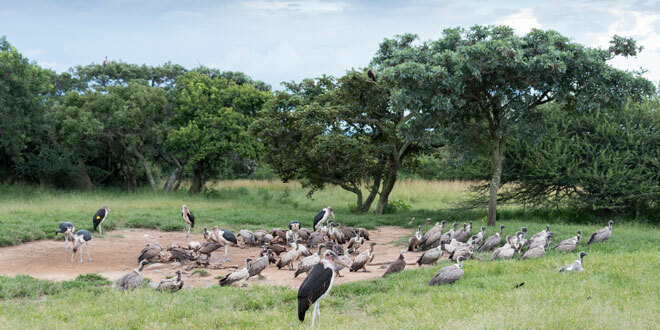 This park is home to the Big Five (lions, leopards, buffalos, elephants and rhinoceroses), hippopotamuses, elands, kudus, oryxes, zebras, giraffes, wild dogs, baboons, hyenas, and servals, amongst many more. In addition, there are hundreds of bird species that include some very exciting birds of prey. The Blyde River Canyon and the reserve of the same name offer spectacular views of some of the most dramatic landscapes in the country. Massive mountain ranges, adorned with green vegetation, roll on for as far as the eye can see, looming over the huge clear-blue river. The panoramic views of the Klein Drakensberg account for this area’s being named the Panorama Route. Some of the most exquisite must-sees in and around Blyde River Canyon are the Three Rondavels (three dolomite spirals that erupted from the wall of the canyon, covered in greenery and a vivid orange moss), Bourke’s Luck Potholes (massive swirling holes that have formed over thousands of years of water erosion), and God’s Window (showcasing the splendour of these vistas from breath-taking heights). Hoedspruit has a bit of a rural look and feel to it, but is well equipped for its visitors. Its airport makes it all the more accessible. This town is the proud home of the Hoedspruit Endangered Species Centre, which is a breeding and research centre that is focussed on protecting and helping endangered species to survive. The species that can be seen here include black-footed cats, rare African wild dogs, blue cranes, ground hornbills, rhinos, and cheetahs. This is an awesome facility for families to visit for a guided tour, or for school groups to have an educational tour. The Moholoholo Rehabilitation Centre – here, poisoned and injured animals are cared for. Visitors can see rescued leopards, cheetahs, wild dogs, vultures, eagles, and even lions that were whisked away from an abusive circus environment. The Blyde-Olifants Conservancy – this represents a collection of private game reserves through the central Lowveld region and celebrates the natural abundance and diversity of the Limpopo Province. Previous: Lets Go Jeffreys Bay!